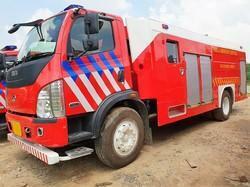 We are a leading Manufacturer of fire fighting vehicle rental service from Gurgaon, India. We are a unique name in the industry to provide our precious clients the best quality Fire Vehicle Rental Service. The provided service is carried out by our skilled team of professionals in the best possible manner. While performing this service, our experts ensure that the offered service delivers precision results and is within the budget to attain maximum clients’ satisfaction. Moreover, this service is widely acknowledged by our valuable clients for its flawlessness and hassle-free execution.